One of TSN’s hockey analysts Bob McKenzie (TSN is Canada’s version of ESPN), said today on Twitter that the 2013 Winter Classic matchup will be made official at Thursday news conferences. He also said the matchup will be Toronto vs. Detroit in the Big House. This is obviously the worst kept secret in the entire NHL. It has been rumored for over a month that this would be the next matchup. The NHL is dying to get more people to attend the Winter Classic, and what better way to do that than have the game in the biggest football stadium in the country. This matchup gives the original six another pairing in the Winter Classic, and will keep Canadians at bay from complaining about another Winter Classic with only American teams. The only issue that remains unresolved is the fact that HBO sports has not decided if they will continue doing 24/7 Road To The Winter Classic. If there is a second Winter Classic with the Red Wings involved and no 24/7, I might lose it, and I know my roommate Kevin will have to be put on suicide watch. 24/7 is arguably the best part of the Winter Classic. Scratch that, not arguably, it IS the best part. But HBO sports executive producer moved over to NBC Sports Network (channel formerly known as Versus), and that is why you see the new TV show NHL 36 popping up on your guide from time-to-time. I know a lot of Michigan fans will be upset that the NHL will probably break the attendance record, and set the bar high enough that it will not be broken ever again, but this is great publicity for the University. Not to mention, there is apparently a plan to have the GLI outside this year at either Comerica or the Big House, which would be very cool to see as well. I can also honestly say that playing hockey on the Big House field is truly amazing. The ice was far better than I anticipated, and it is by far the coolest experience of my entire life. The NHL just needs to pray that Michigan has a real winter next year, instead of this spring time weather that we had in January. My real reason for writing this post is that it is truly baffling how information like this is public for so long, and then the NHL acts like they are announcing something new. Who leaks this information to the media? And why are they not fired? The NHL has to be aware that this information is all over the Internet, and if they are not, then what the hell have they been doing? This article on Puck Daddy was written over a month ago, and he talked as if it was already a done deal. The NHL’s front office needs to find their leak and get it fixed. This entry was posted in NHL and tagged 2013 Winter Classic, 24/7 Road To The Winter Classic, Comerica Park, espn, GLI, hbo sports, nbc sports, NHL, The Big House, Toronto Maple Leafs, TSN, University Of Michigan. Bookmark the permalink. While I think it should be downtown Detroit, I also understand it from the ticket perspective. Regardless it will be quite an atmosphere at the Big House for that game. Hopefully if they have the GLI at Comerica attendance will be solid. It seems that attendance in general for college hockey at the Joe has been on the decline. 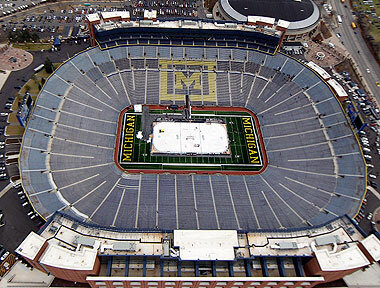 To have some OHL, High School and all of the GLI games at Comerica, it will allow people who can’t necessarily make the trip to the Big House to experience the outdoor atmosphere. I personally don’t see Comerica selling out for any of the GLI games, but getting people in the building will appease Mike Illitch. I firmly believe that he wanted the game at Comerica to keep it in Detroit, but NBC and the NHL saw the idea of breaking the Big House record, and the massive amount of people they could pile in and they got the idea in their head to have it there. The added bonus to this is that Dave Brandon said he hopes that the NHL game breaks their record, so that in the future, they can have another Michigan outdoor game at the Big House to try and re-break it.